At least 16 US government employees were treated for symptoms after a possible acoustic attack targeting embassy staff in Cuba, the state department says. The Associated Press reports that the sonic devices used may have been emitting inaudible sound waves that can cause deafness. Intense sound can cause structural damage to the receptor hair cells in the inner ear which convert sound into brain activity. There is also evidence that noise exposure can lead to degeneration of the nerve fibres that make contact with the hair cells, which means that even if the hair cells remain intact, the transmission of information to the brain can be disrupted. However, frequencies that are inaudible to humans do not transmit much mechanical energy to the ear's sensitive parts, and so experts believe that it would be difficult to use them to damage hearing. There is limited evidence that exposure to ultrasonic sounds above the range of human hearing may be associated with symptoms such as excessive fatigue, headache and irritation. A German study has also found that the ear may be temporarily more prone to damage after being exposed to low-frequency sounds. 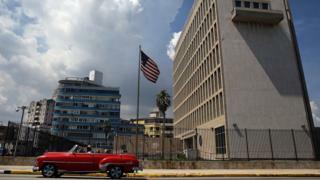 What is behind the US-Cuba thaw? Trump's new Cuba policy: What's at stake for the island?